An albumen print from the National Museums Liverpool-Merseyside Maritime Museum pictures crewmen on deck of the Confederate cruiser Alabama off Cape Town, South Africa, in 1863. This is the first time this image has been published. 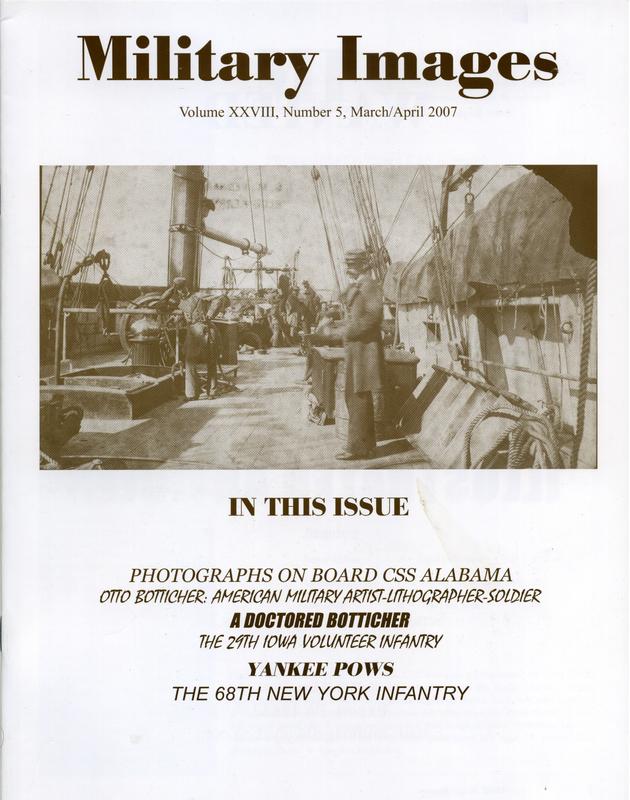 The editor previews the contents of this issue with emphasis on the Alabama and a profile of artist-lithographer-soldier Otto Botticher. Four books are recommended: Rough Riding Scout, The Story of John W. Mobberly Loudon’s Own Civil War Guerrilla Hero (Elden Editions) by Richard E. Crouch; The Civil War Collector’s Price Guide 11th Edition (Publisher’s Press, Inc.) by North South Trader’s Civil War; The Darkest Days of the War, The Battles of Iuka and Corinth (The University of North Carolina Press) by Peter Cozzens and The Wilderness Campaign (The University of North Carolina Press), edited by Gary Gallagher. Subtitled “The first time publication of a photograph taken aboard the Confederacy’s most famous raider,” the author details three albumen prints that appeared in a catalog issued by a London book dealer. Two of the images, of Capt. Raphael Semmes and 1st Lt. John McIntosh Kell on the deck of the vessel, are fairly well known. The third, reproduced on the cover of MI, is previously unknown. This image is explored in depth with several enlargements to highlight salient details. Subtitled, “We’ve all seen his military prints, but who was Otto Botticher?” Historian Seward Osborne went in search of the answer and presented his findings in this profile of the German-born artist. He served as an officer in the 68th New York Infantry during the Civil War and was captured by Confederates near Manassas on March 29, 1862. He eventually returned to his regiment and fought through the rest of the war, suffering a wound in the Battle of Gettysburg. Numerous examples of his military art survive, which cleverly melded photography and art into lithography. Botticher died in 1886. Patrick Henry Jones, a Union brigadier who was once colonel of the 154th New York Infantry, is at the center of this story of a Botticher print titled “Sherman at Savannah, Ga.” An admirer of Gen. Jones commissioned an artist to replace the likeness of Maj. Gen. Henry A. Barnum with Jones. The story is illustrated with details of the image and photographs of Jones and Barnum. The author profiles six soldiers who fell into enemy hands during the war: Richard Thomas of the 99th New York Infantry and 6th U.S. Infantry, captured on March 8, 1862, at Hampton Roads, Va.; Edward Hayes Swisher of the 7th Pennsylvania Reserves, captured first during the Peninsula Campaign and again in The Wilderness; Joseph S. Stigler of the 2nd Pennsylvania Heavy Artillery, captured at Chaffin’s Farm; Abraham Loane of the 2nd Massachusetts Cavalry, captured near Aldie, Va., in 1864, Samuel T. Moles of the 47th Illinois Infantry, captured at Holly Springs, Miss., in 1862, and Frederick B. Nesbett of the 5th Main Infantry, captured at Salem Church, Va., in 1863. Subtitled, “Exposed to sickness and rebel bullets, service in Arkansas & Mississippi took its toll on this regiment from the Midwest,” the author provides a sketch of the 29th that is illustrated with photographs from the collection of the Butler Center for Arkansas Studies. They include Orlando H. Bagley, Thomas H. Benton Jr., Isaac C. Catlett, William M. Carlile, Octavius B. Gaddy, Bird Hagans, Frederick D. Hahnonkratt, Francis M. Haskins, Lemen D. Helm, William M. Hindman, John S. Miller, James L. Mitchell, Heslip W. Rodgers, Wesley M. Rodgers, Robert Salen, John B. Thomson and William H.W. Wax. In “The 68th Regiment, New York Volunteer Infantry,” McAfee examines the service record of the regiment and the uniforms and equipment that they were issued. Images that accompany the text include Robert J. Betge, Johann H. Kleefish and Heinrich W. Reissberger. One additional image that the author believes may be Otto Botticher is also included. A sixth-plate ambrotype from the Brian Boeve collection is a portrait of Pvt. James Robert Gwin of the 17th Battalion Virginia Infantry and the 11th Virginia Cavalry. Gwin survived a wound in the Wilderness and the Civil War. He lived until 1923. A carte de visite from the Don Ryberg collection pictures Cpl. Joseph H. De Castro of the 19th Massachusetts Infantry. He received the Medal of Honor for his capture of the colors of the 19th Virginia Infantry during Pickett’s Charge at the Battle of Gettysburg. He survived the war and died in 1892. A ninth-plate ambrotype from the David W. Vaughan collection pictures a young boy posed with flowers. The image shows all indications of being a post mortem with the exception of his eyes, which are wide open.